Why is reach more expensive? Are there BENEFITS to marketing during the holidays? Who’s the best audience for me? When do I know it’s time to TURN OFF ads? How can I make my ads stand out among the NOISE? Tune into this episode for a quick (10 minute) “how to” before your holiday promotions and sales, and then, get to work! [6:01] Which kinds of ads will work BEST this season? 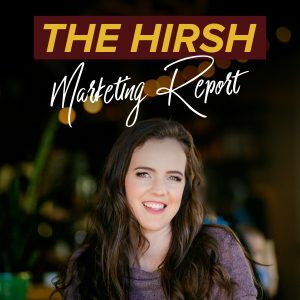 If you’re ready to apply to work with Team Hirsh, go to HelpMyStrategy.com (we’re capping out at 75 clients this year, so grab your spot asap!). I wanted to address that today in this episode. My answer is, “Yes and no,” so it’s a little more complicated than that. First I want to talk about the importance of warm traffic during this time. The basic answer is yes. Most likely your ad cost will go up a little bit, not because Facebook is charging you more, but because reach is more expensive, because there is more competitiveness out there with other companies marketing and spending more dollars, right? 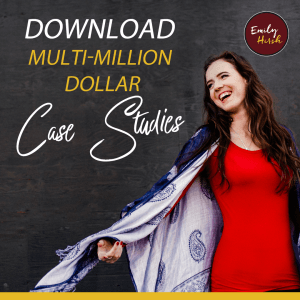 There’s only so much dollars that Facebook, you can spend to get reach, so if it’s more competitive to reach your people, then it’s going to be more expensive to get the reach. Therefore, your cost per lead or cost per purchase might be a little bit higher. I totally have some clients that either do better or the same during the holidays. I have some clients who, it does convert a little bit higher, but not crazy, so we still keep the ads on. Then we just take it into consideration if it gets really high for a client, and what we should be doing during this time. But I don’t have any client where we actually just shut ads off November and December because it’s more expensive. Because it’s such a small, noticeable difference in most cases that you just have to plan for it, but it’s not so much that you would actually make more money by turning it off. Like everybody still wants their funnels and their traffic running because it’s converting, right? So, yes, ad cost goes up because it’s more competitive in the ad space on Facebook, but there are some benefits to marketing in the holidays. One big one is it’s a great time for sales and promotion, obviously depending upon your company, but like Black Friday, Christmas sales, and then January and New Years is huge for most people. It’s a great time to launch. What that means though is, your best audience is going to be your warm traffic during any direct sale promotion, when you’re just trying to sell something. So I wouldn’t even suggest running like a Black Friday sale ad to cold traffic because it probably won’t convert if there’s not a trust factor already there with you. But if you run it to your warm traffic it won’t be as expensive because it’s your warm audience. They already follow you. It’s not a crazy, competitive audience. No other company has that exact warm audience that they’re targeting as yours. It’s unique to your business. So they are your best bet, and that’s why it’s so important to constantly be building up that warm audience. Also, people are running webinar campaigns, opt-in lead magnets. They still have their funnels on, and one interesting thing that I have noticed is sometimes like webinars and video series and opt-ins convert better over the holidays. My theory and I don’t know for sure, and it’s obviously unique to each business, but my theory is because sometimes people are off work, they have more time on their hands, they’re sitting around, bored at their mom’s house or family’s house for the holidays, so they’re actually opting into more things and scrolling Facebook more than they normally would if they were just everyday life at work and busy with whatever they have going on. So that’s my theory, and it’s interesting because one of our biggest clients last year … I actually started working with them right before the holidays, and they were pretty convinced that they had to pretty much turn off ads for most of November and December. And I was like, “No, I think we shouldn’t do that unless the ad cost goes up,” and that’s what I would suggest. If you’re feeling like maybe it’s going to get so expensive, and I should just turn it off, don’t just make that decision without the data and the numbers to prove it. If it gets crazy expensive, and you can’t bring it down, and you do the things that you would normally do to bring it down, meaning, new audiences, new creative versions, and you can’t bring it down, then maybe you consider it. Like I said, that’s never happened to me in a client account, that it’s gone up so much that we had to turn the ads off. It’s just usual maintenance honestly, and management for the accounts during this time period. And like I said, sometimes it converts even better. Last year, this big client, we left all the ads on, it converted great, better, the same, as it does all year long. We kept the same amount of spend, and we didn’t even scale back, and they were really surprised. But for me it’s like, don’t make the decision to turn off an ad until you know for sure that it’s going to go up in cost, right? It always comes down to the data, not just the theory of what you think is going to happen. It’s the numbers and the data. So that’s an important piece, and it’s interesting when it converts actually better because I think more people are scrolling Facebook. So it’s great time for actual visibility ads too because more people are just consuming content, especially free during this time period, and they may not be buying as much. Cold traffic going into a webinar may not convert into a sale as much because they’re being careful with where they spend their money because of the holidays, but they’re still coming into the funnel, and they may buy in the future and they’re still valuable leads. So monitor it. Does your cost per lead go up? Does your cost per sale go up? Does your webinar conversion go down? Monitor all those things so that you also can plan for next year because that’s super key too. You can plan your revenue for that. Warm traffic is like I said, the best, and it’s super important in order to keep your costs down that your ads stand out. So it’s even more important as the space gets more competitive that your ad and your creative stands out from everyone else. One thing I also encourage people to do, and we do with our clients, is like where it’s relevant, actually create ad copy and creative that that has to do with the holidays to keep the ad cost down. Because if you have something that you can tie into the time of year, it’s going to make their life easier during Thanksgiving, or it’s a fitness thing that’s going to prepare them for Thanksgiving. We’ve done that before, like a challenge. It’s something that’s going to make their life easier for Christmas or easier for the stress of the holidays, or set them up for success in the New Year. Whatever it is, your messaging should actually speak to that because people will relate to it. So don’t just go about the regular thing if you can actually leverage this time of year, and possibly get your cost per lead or cost per purchase, your ad cost down. In summary, don’t turn off your ads. You don’t have to do that. Let the numbers speak for themselves. Like I said, we have over 65 clients on our roster, and nobody is pausing for November and December because their ad costs are getting crazy. Most likely that won’t happen to you. If you have a sale promotion, it’s going to be best for warm traffic at this time. People who already have a know, like and trust factor with you are most likely the ones who are going to become customers because yes, people are a little bit more careful with how they spend their money. But if you spend now, November and December, preparing for New Year’s and then you’re launching in January, and you’re building up that audience and that trust and brand awareness in these next few months, that could set you up for success in January. So plan for those things, and actually leverage this time of year to your advantage versus just kind of shutting it off and be like, “It’s not a good time to advertise.” Because sometimes it’s a great time, and it is a great time, you just have to cater to what’s going on for your customers, like what are they going to be dealing with, and speak to that and connect to that, and be aware of that, and you will see success. If you guys want to apply to work with Team Hirsh and set up holiday promotions or plan for anything happening in the New Year, like I said, January is a massive launching time … We’ll have to cap out how many launches we can do at one time in January … So I encourage you to plan ahead, and if you go to helpmystrategy.com, you can book in a call, and apply to work with Team Hirsh.